The global rheumatoid arthritis drugs market was valued at US$ 19597.4 Mn in 2016. It is anticipated to expand at a stable CAGR of more than 2.5% between 2018 and 2026, according to a new report published by Transparency Market Research (TMR) titled “Rheumatoid Arthritis Drugs Market – Global Industry Analysis, Size, Share, Growth, Trends, and Forecast, 2018–2026”. Expansion of the global rheumatoid arthritis drugs market is due to strong research & development and increasing awareness regarding usage of biologic drugs for rheumatoid arthritis treatment during the forecast period. The rheumatoid arthritis drugs market in Asia Pacific is expanding with a high potential to grow, registering a CAGR of more than 3.0% due to the high prevalence of diseases, development in health care sector, and increased focus on research and developmental activities in the region. The global population is aging rapidly, especially in some developed countries such as the U.S., most countries of Western Europe, and Japan. Developed countries witnessed high rates of aging as compared to the developing countries. This is attributed to improved health care infrastructure, reimbursement policies, and advancement in health care facilities in these countries. Moreover, easy access to various drugs treatment has improved in recent years, especially in developed countries. This, in turn, has boosted the life expectancy of the population. The geriatric population is a major end-user of rheumatoid arthritis drugs treatment for the improvement in the quality of their lives. Increase in number of geriatric people leads to high rate of ailments, which in turn is likely to propel the demand and consumption of various drugs. Demand for development of newer and biotechnologically enhanced products such as biologics and biosimilar is rising globally, owing to the treatment efficiency of drugs. Hence, major players operating in the rheumatoid arthritis drugs market are investing in research and development programs in order to develop new drugs. In 2015, Takeda Pharmaceuticals invested US$ 3.2 Bn in research and development activities. According to an annual report published by GlaxoSmithKline plc, in 2015, the company partnered with more than 1,500 companies and other academic organizations around the world for the development of new drugs. Rise in investment in research and development programs by key players of the market is likely to boost the market significantly during the forecast period. Major companies focus on strategic alliances for sales and distribution in order to increase business in untapped markets. For instance, Merck, a prominent drug manufacturer, entered into an alliance with Immulogic Pharmaceutical, a startup, in order to develop drugs for auto-immune diseases such as rheumatoid arthritis. Increasing strategic alliances coupled with new product development is expected to boost the rheumatoid arthritis market. In terms of drug type, the market can be divided into disease-modifying anti-rheumatic drugs (DMARDs), non-steroidal anti-inflammatory drugs (NSAIDs), corticosteroids, and biologic response modifiers (biologics). The biologics segment is likely to account for a leading share of the global rheumatoid arthritis drugs market during the forecast period, owing to the rising adoption of biologic drugs in severe chronic diseases. Strong research and development in biologic drugs is estimated to propel the biologics segment during the forecast period. Based on distribution channel, the market can be segmented into hospital pharmacy, retail pharmacy, and online pharmacy. The hospital pharmacy segment is estimated to expand at a prominent growth rate during the forecast period, owing to the increase in number of hospitals. Based on geography, the global rheumatoid arthritis drugs market is divided into major five geographical regions: North America, Europe, Asia-Pacific, Latin America, and Middle East & Africa. North America is estimated to hold a leading share of the global market during the forecast period, owing to the high rate of adoption of biologic drugs and high health care expenditure in the region. Europe is anticipated to account for a significant share of the global market between 2018 and 2026. Increase in the incidence of rheumatoid arthritis diseases in Europe is projected to fuel the market in the region during the forecast period. The market in Asia Pacific is projected to witness expansion at a high growth rate during the forecast period, due to increasing health care expenditure in the region. The rheumatoid arthritis drugs market in Latin America is at a pivotal point, currently. It was valued at US$ 866.1 Mn in 2016 and is anticipated to witness significant expansion in the near future. Increasing focus of key players on expansion in Asia Pacific, in order to cater to the large untapped population, and rising awareness about health care propel the rheumatoid arthritis drugs market in the region. Key players covered in this report include Pfizer, Inc., Novartis AG, Sanofi S.A., F. Hoffmann-La Roche Ltd., Merck & Co., Inc., Bristol-Myers Squibb Company, Eli Lilly and Company. 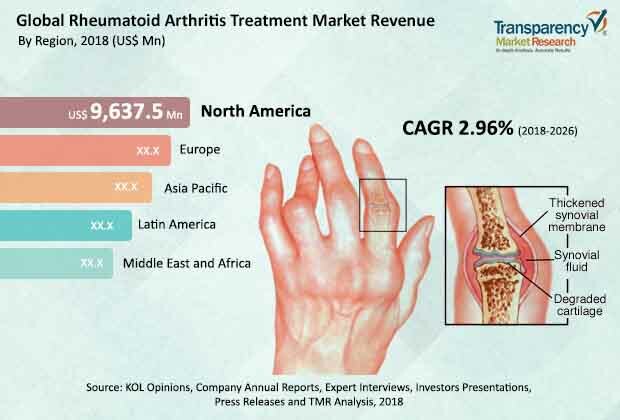 Companies operating in the global rheumatoid arthritis drugs market are focusing on strategic collaborations in order to develop new products in emerging markets such as Asia Pacific and Latin America.